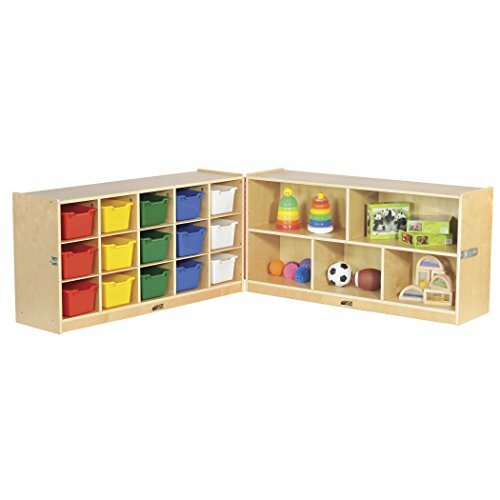 Designed to keep children's items organized, the Birch Fold & Lock Storage Cabinet with Casters by ECR4Kids is ideal for school classrooms, daycares or home environments. Kids can store art projects, homework or use as a personal space. Teachers can use as classroom organizer for supplies, books, games or toys. Constructed of durable hardwood with full-length piano hinges, rounded edges for added safety and optional casters for mobility. Available in three different heights (24", 30" or 36" H) with or without ECR4Kids scoop front bins included. Recommended for kids 3 years old and up. Adult assembly required. The BIrch Fold & Lock Storage Cabinet has achieved GREENGUARD [GOLD] Certification for meeting or exceeding standards for low emissions into indoor air during product usage. With a concentration on the Pre K-12 sector, ECR4Kids offers a wide range of products including classroom tables and chairs, preschool rest time solutions, hardwood storage cases, blocks and manipulative, mobile organizers and a variety of indoor and outdoor play structures.